Razer's latest mean gaming machine is finally ready to ship to the hands of eager gamers since we first heard about it back in July. The Ouroboros Elite is a wireless gaming mouse that features an array of 11 programmable Hyperesponsive buttons, an 8200 DPI 4G dual-sensor system that tracks on virtually any surface, ultra responsive 1ms wireless technology for wired-like gaming experience and a unique and customizable ambidextrous design with an adjustable arched palm rest, adjustable length and two different types of adjustable side panels to help place your thumb and pinky finger at ease while pwning responsibly. 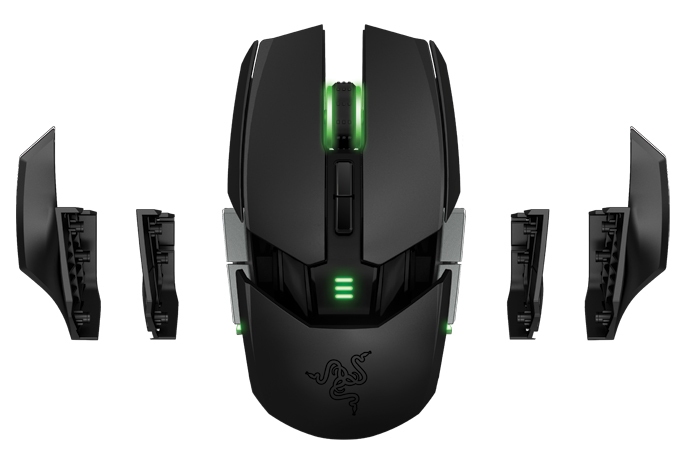 You can grab the Ouroboros Elite with all of its sweet green lighting goodness right now for $130 thru Razer and Amazon.